Fur coats above the knee are mainly presented in overlays style. A lowered line of shoulders, wide sleeves, large collars and cuffs, a straight silhouette and an unmarked waist are the main features of such a fur coat. In the collections of Louis Vuitton, Nina Ricci, Versace, Michael Kors, Fendi, Marc Jacobs you can see chic, dimensionless models that are suitable for any figure. A miniature silhouette of such clothes will make it even more graceful, emphasizing the fragility of the girl, and fashionable women with curvaceous shapes will be able to hide problem areas and mask those extra pounds with this style. Short jackets are presented this season in the style of sport. A short fur coat with a hood, a fur jacket-bomber jacket are very comfortable and popular among young people, however, for severe frosts, unfortunately, they are not very practical. Sew such fur coats from sheepskin or muton, often there is a triangular cut and comfortable pockets that allow you to do without gloves. Designers also offer cropped fur jackets with a round neckline that will successfully complement an evening or cocktail dress, provided that you do not have to be outside for a long time. Short coats show Givenchy, Nina Ricci, Saint Laurent and other fashion designers. Louis Vuitton, Philipp Plein, Blumarine, Roberto Cavalli demonstrated fur outerwear in snow-white and coal-black. In addition to the traditional classic shades, many designers offer fashionable women in this year bright coats of bold colors. The main shade of the year Marsala was not spared and fur products – red-brown fur coats are perfectly combined with both red ankle boots and brown shoes. In the trend of deep blue, aquamarine, emerald, marsh shades, as well as wine and berry tones. Bright coats have been seen in the collections of Versace, Dolce & Gabbana, Moschino, Giorgio Armani. Bold women of fashion offer a closer look at the fur coats in a shade of lime, and the gray-blue color of a fur coat suits the ladies more modestly. To dress was not only relevant, but also impressive, pay attention to the striped fur coats. Parallel strips of fur of different shades sewn together create a certain gradient, and a multi-colored fur coat is replete with rich colors that harmonize with each other. Please note that when dressing in such an extravagant coat, try to select the most concise and modest plain clothes, shoes and accessories. 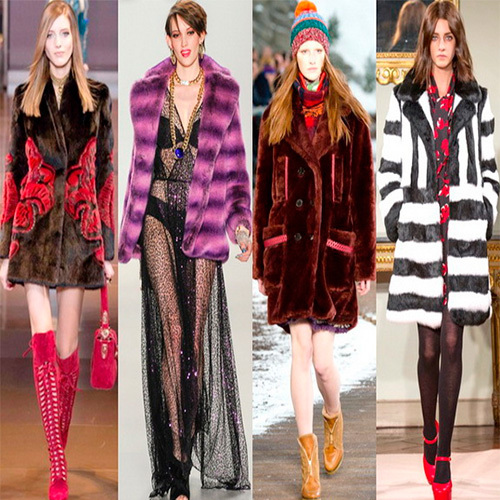 In multi-colored fur coats not only even stripes are welcome, but other options, such as patches (patchwork technique) or abstract elements, look at these coats in Saint Laurent, Gucci, Emilio Pucci. Tom Ford, Louis Vuitton and many other fashion designers have decided that the “predatory” print remains among the trends, but it is becoming more exotic. If it is a leopard, then it should not be in its natural shades, but, for example, in the color of sea wave. Fur coats that imitate the plumage of exotic birds will do. It is simply luxurious to look fur, in which the undercoat is of a different shade, such a decision creates amazing overflows. Fashionable coat is not necessarily a natural material. Great news for nature conservationists – artificial fur is in fashion, which makes winter fashion not only more humane, but also significantly more accessible to many beauties. Beautiful and warm mink coats can rightly be called the most popular option of outerwear made of fur. In addition to straight and fitted midi and knee-length styles, the designers offer mink coats of the “tulip” style – with a low waistline and lush hem. Such models are recommended slender fashionistas.